Julie Fergus, ASID | NH Interior Designer: Organization or Containers? I am a big fan of organization. So when on a recent trip to NJ, I had to make a stop at the Container Store to see all of the possibilities for storage solutions. The vast space is neatly laid out and uncluttered. It is inspiring to a person that pines to be organized. These storage components won’t cure you if you are a clutter bug. It isn’t a quick fix or solution. Being organized isn’t just about having your stuff on shelves or bins. The real work begins by simplifying what you have. Don’t spend money on more stuff to store your stuff. Get rid of the stuff and you won’t have to spend more. Don’t fall into the trap of thinking that pretty organizers and bins will solve your storage challenge. Cleaver storage is more than a new clear plastic bin or shoe organizer. It starts with evaluating what your needs are and how to maximize the space you have. Once you do that than you should store what is essential. I know I have over-simplified the challenge of getting organized. I urge you to think about bringing more things into your home unless you’ve dealt with the things you already have in your home. If you need help getting organized, contact a professional organizer or interior designer with an expertise in space planning to assist you. The before and after photo above illustrate the makeover in a small vacation cottage. 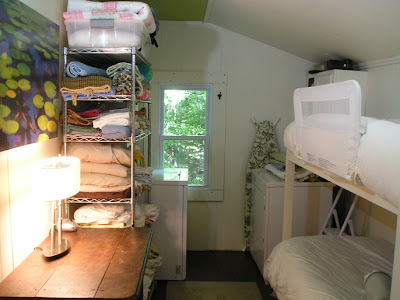 The laundry and bunk room are combined. To improve the overall functionality of the space we had to eliminate one set of bunk beds. This gave space for much needed storage and folding area. New paint, artwork and lighting are the finishing touches to make the room bright and pleasant.